Are we nearly there yet? How far have we come on the road to gender parity? Women in Transport’s Autumn Reception put the spotlight on our progress on gender parity. We spent a lively evening discussing what has been achieved so far, our future aspirations and how we can progress on gender parity. The event, on a subject that raises many questions, emotions and challenges, attracted more than 100 guests and was generously hosted by Arup. 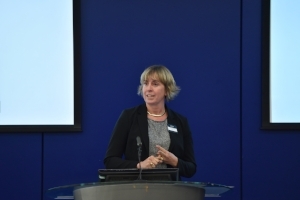 Katie Hulland, President of Women in Transport, opened the session by sharing her thoughts on whether the transport sector is nearly there yet. She said that statistics show that we are not nearly yet there. We are getting there but progress is slow. Katie stressed the importance of changes in perception, behaviours and societal culture. Crucial ingredients to make our sector truly inclusive and allowing us to broaden our reach beyond our own communities. She set a call to action for more effort in engaging men in gender equality. 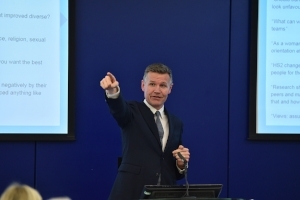 Robert Nisbet, Regional Director of the Rail Delivery Group and spokesman for the rail industry, chaired the panel discussion. In his introduction Robert said the lack of women in senior roles implies a ‘glass gantry in the transportation industry that needs to be shattered’. He urged the industry to work together to reap the benefits of achieving a diversity of voices. In her opening provocation Isabel Dedring talked about her personal perspective on gender issues and invited the panel and the audience to explore the topic and express their views. She offered a root cause approach to understanding the gender equality issue and suggested designing for zero failure to achieve 50/50 gender balance throughout the system. Isabel stressed the importance of setting clear targets to achieve transformational change and highlighted opportunities to diversify by embracing new technologies and looking to new, more agile, business models to ensure we have the talent needed to deliver future transport projects. The panel shared their observations about gender equality in the workplace and their own personal experiences, before responding to questions from the audience. The discussion highlighted the importance of talking about gender equality, taking individual responsibility for promoting diversity and inclusion in the workplace and our communities, the value of male allies and staff networks and the benefits and challenges of promoting flexible working arrangements for both men and women. It also touched on how to inspire the next generation by becoming STEM ambassadors and offering work experience. Statistics show that the employment of women in transportation has grown over the last 50 years compared to other sectors. Women account for 50% at entry level but that has been shrinking more rapidly than in other industries. The representation of women in operational roles in transport (80% - 90% of roles) is still much lower than in non-operational disciplines. Frustratingly, the percentage of women in transport decreased by 1% last year from the baseline 22% EU-27 calculated statistic. However, women have come a long way when compared to just five years ago, as women contribute more to transport planning, design and delivery in the UK. 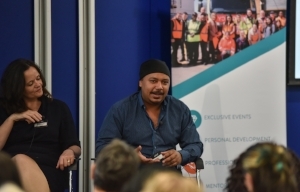 A number of organisations are demonstrating their commitment to equality and diversity by supporting the professional development of women across the transport sector. The personal experiences shared suggest that women are often surrounded by supportive environments during their upbringing, where both men and women are challenged to succeed. Younger women are having more positive experiences of being treated as an equal in the workplace and face less constraints, particularly at the beginning of their career. However, the panel frequently reiterated the importance of strong role models and mentors, particularly male allies, who can support women at all levels. There is progress to be made, particularly for women advancing to more senior roles, so that their ambitions are championed in the same positive way as men's. Women themselves can be pro-active in voicing their career goals and negotiating compensations based on their contribution to businesses. The challenges women face are not always gender biased, but rather specific to the environment. Women and men across the board must become more comfortable talking about gender equality. Staff networks and external networks ,such as Women in Transport, play an important role in continuing this dialog for the benefit of everybody. The very clear benefit of having a greater representation of women in the transport workforce to reflect the population we serve is not widely or well communicated. We need to have a better understanding of where we are, what is not working, what is going well and why diversity matters. We need to focus on clear targets and outcomes to deliver results and clarity of vision. Work on diversity and inclusion extends well beyond gender. Leaders who are accountable for outcomes on equality, diversity and inclusivity can generate significant progress in a shorter time frame. The business case for gender parity is obvious and yet we still have design failure everywhere. There is significant evidence that diverse teams deliver better outcomes. An increase in action and restructuring of fundamental selection and promotion procedures and clear career progression can make a difference. Attention was principally drawn to the importance of training staff in diversity and inclusion to build confidence and competence, removing gendered language in job descriptions and the value of gender parity. Employers must develop competitive advantage not only in attracting, but also retaining talented women. Employee retention programmes can help protect the most valuable employees, but before we can implement a plan to increase employee retention, we need to determine why valuable employees may be leaving. The UK government has launched a campaign to encourage and promote flexible working policies to all employees to ensure retention of talent and improved work-life balance. However, unless it becomes a ‘cultural norm’ at individual and team levels, flexible working will still be considered a potential barrier to progression within the business, particularly by men. Lack of flexible working arrangements for men in all major construction contracts was pointed to as another example of system design failure. Encouraging men to assume responsibility for more of the unpaid labour traditionally seen as women’s work and take shared parental leave can help tackle gender stereotypes. Network Rail set a target of increasing their female workforce to 20% by 2020 through new engagement programmes promoting STEM subjects, apprenticeships programmes, staff networks, enabling career paths aligned with employee’s aspirations, as well as tackling existing key root causes of unequal outcomes for women and men. HS2 has been successfully changing years of industry behaviours to create the most varied and diverse workforce in the industry. Through a process called ‘blind auditioning’ (that removes application forms or CVs entirely, replacing them with skills based assessments) the ratio of women being shortlisted and BAME people rose to 50%. Both Network Rail and HS2 operate dedicated equality, diversity and inclusion (EDI) taskforces. Network Rail offer equal maternity and paternity pay and leave entitlement. The leave entitlement in HS2 has still to be bridged. To show how we have advanced on the road to gender parity, we shared a fascinating timeline of Women in the Workplace setting out women’s legal journey to equality in the UK since 1970, provided by Monster.com which can be found here. If you missed this great event, you can watch the full panel discussion on the video below, thanks to Outtakes FilmCommunications. Our grateful thanks to Arup for their very generous hospitality in hosting this event. Please follow us @transportwm or on Linkedin Women in Transport for the latest events, news and updates.